We all began with appetizers. Almost everyone got samosas, which is hard to argue with. 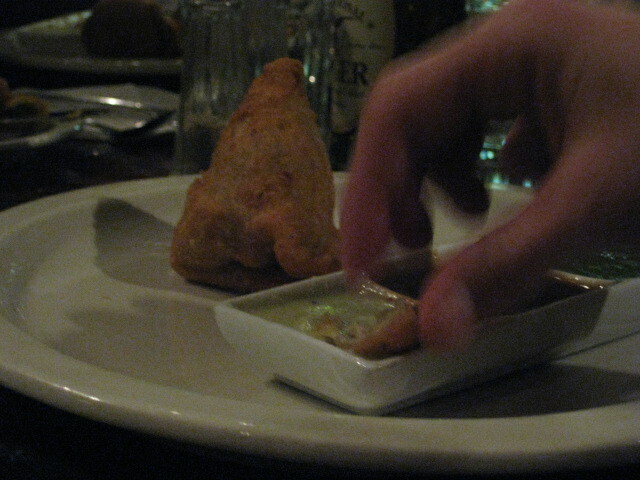 The ones at Tamarind are excellent: crispy on the outside, mild, big enough to cut into chunks and share. So while most of the table is chomping down on their delicious samosas, what do I order? A donut. 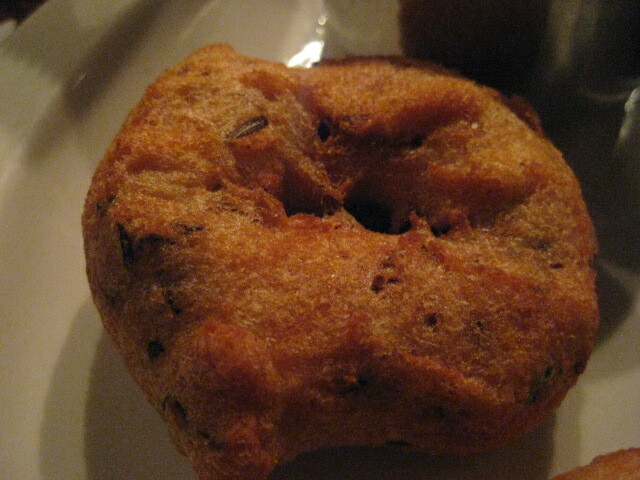 Medhu Vada, to be specific, or fried lentil donut. I expected way more lentils, but it was basically a bland, doughy ring dotted with lentils that served as an agent for sauce delivery (and worked really well as dipped in the little cup of soup served with it). Another problem with trying to review an experience with a group so large is that there were so many dishes to keep track of, I’m not exactly sure what some of them are. 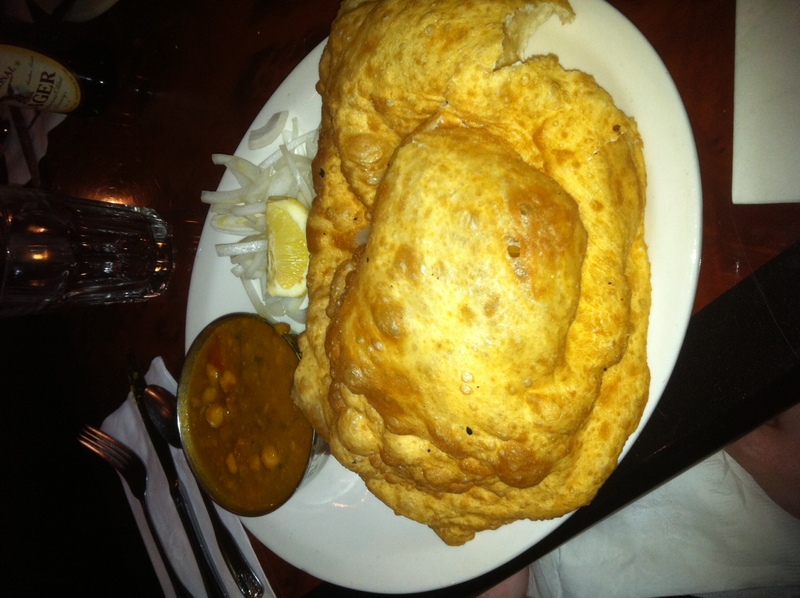 I believe the above is Batura, a crispy, puffed deep-fried bread. I was pleased that Jason ordered the Malai Kofta, because that is more often than not what I ordered, but I opted instead for the Gobi Manchurian. Of the places I’ve had the Malai Kofta, Tamarind serves some of the best, although they fall in line with every other Indian restaurant by skimping on the vegetable balls. Still, the sauce is so flavorful, and especially good when served very spicy. 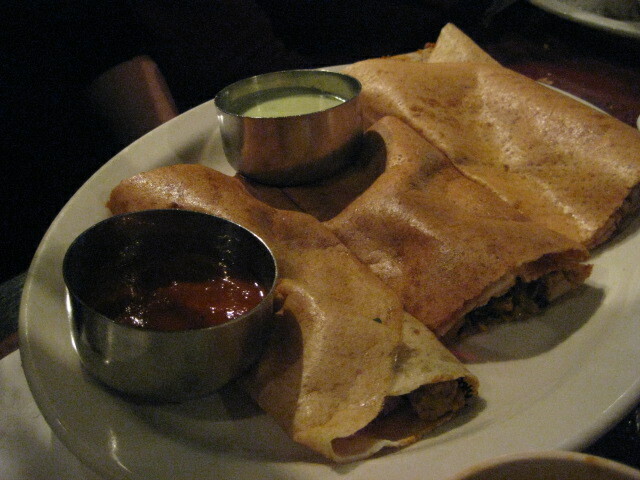 Tamarind’s dosa gets the attention of most the restaurant’s praise, and rightfully so. The chicken dosa that Tina ordered was hearty and spicy, but without needing the additional heaviness of a gravy or extra grain of accompanying rice. I have never been a fan of cauliflower, but as of last summer, I decided it was time to conquer my long derided enemy. During my first visit to Tamarind, Jason helped me reach a milestone in my cauliflower fight by introducing me to Gobi Manchurian. When served dry (sans gravy) the Tamarind version tastes a little like Korean barbecue spareribs: chewy, smokey, and surprisingly meaty. 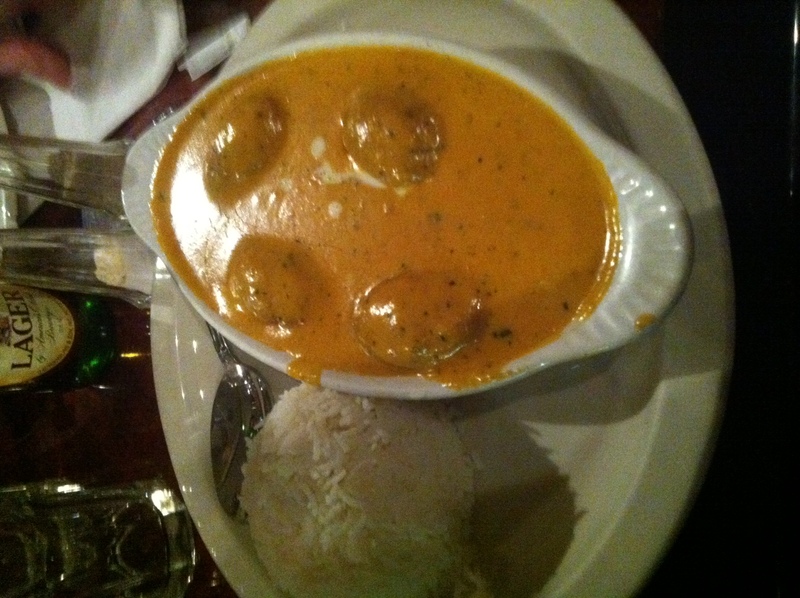 When served wet (gravy, as pictured above), it’s almost like eating a South Indian jambalaya. The chewiness of the fried cauliflower dissolves a bit in the thick sauce, but the smokiness remains. I got mine at a ten, and the heat was enough to clear out my sinuses from dinnertime to the next morning. There was way more food on the table, including bread that I didn’t know had been ordered until I was already full. Everyone had nothing but stellar things to say in regards to the food. The service was also quite good: our waiter was super attentive and friendly, accommodating all specific requests, keeping our glasses fresh with water, and quickly brought out our drink order before the appetizers had been put in. I really can’t say enough good things about Tamarind. With two other locations in Cranberry and Oakland, this is yet another regional mini-chain that delivers the goods on tastes, but also with low-key casual dining charm and attentive, accommodating service. 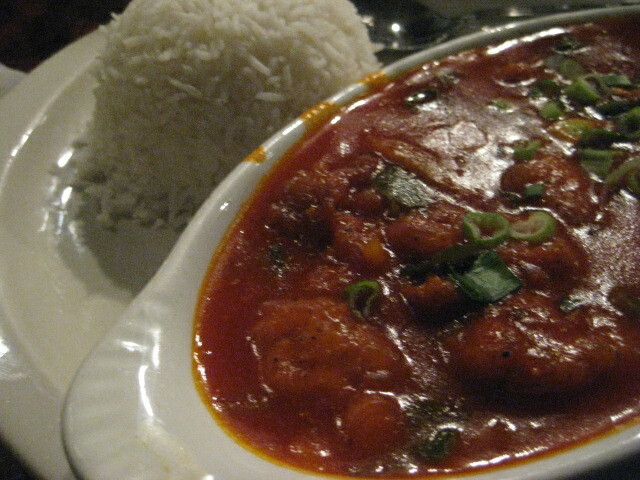 This entry was posted in Dining Out, Dinnertime!, Food and tagged batura, cuisine, dining out, dinner, dosa, food, gobi manchurian, indian dining pittsburgh, indian food, indian restaurant, malai kofta, medhu vada, north indian, pittsburgh, restaurants, samosa, sauce, scott towne center, south hills, south indian, spice, tamarind, tamarind savoring india, vegetarian. Bookmark the permalink. I am not a fan of Indian food, however, I have been to Tamarind in Scott Twp since Greg and his family love it. They are really friendly and always remember him. I like the plain dosa and the naan (sooo good) and chicken tikka masala (lowest possible spice level!). Call me wimpy! They also have a nice, fairly inexpensive weekend lunch buffet. Pingback: Good Morning… Cauliflower | Forked! Pingback: Good Morning, Cauliflower Cheese Soup! | Forked!